Perhaps you've used those programs that let you design your dream house, creating a Computer Aided Design (CAD) file. Not quite ready to take up the hammer and start building? 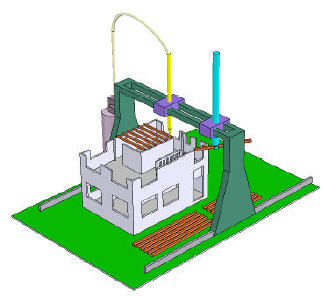 Can you imagine a device large enough to let you "print" your house right straight from the drawings? Behrokh Khoshnevis (USC Engineering) has been perfecting his contour crafter. The material used is a semi-liquid quick-setting, concrete-like compound. The system is able to make calls to onsite experts for insertion of plumbing and wiring as the construction effort proceeds. House construction is an incredibly wasteful process. It is estimated that builders in the United States generate approximately 31 million tons of construction waste, almost one-quarter of the total municipal solid waste stream in the United States. Khoshnevis claims that contour crafting could substantially reduce these numbers. "The goal is to be able to completely construct a one-story, 2000-square foot home on site, in one day and without using human hands." There are a couple of science fiction tie-ins for this idea. For a hotel that puts itself together (albeit brick-by-brick) see Bambakias Hotel, from Bruce Sterling's 1998 novel Distraction. Another interesting idea that uses a similar technique on a small scale is nanofax, from William Gibson's 1999 novel All Tomorrow's Parties: this item has an extensive discussion of stereolithography, a method of rapid prototyping that is the direct ancestor of contour crafting. The lunar regolith, for example, may be used as the construction material. Other researchers have shown that lunar regolith can be sintered using microwave to produce construction materials such as bricks. We envision a Contour Crafting system that uses a limited amount of water to form a small batch of the lunar material into paste form. Once extruded and deposited in the desirable location, the water could be extracted and recycled for the next batch of material. Microwave sintering using solar power can be integrated into the system and hence progressively cured structures of various complexities could be built." (End Update.) For more details see Robot Builder could 'print' houses (NewScientist.com). Don't miss the very cool animation showing how it works: Animation of Contour Crafting in House Construction. Contour Crafting and Selective Inhibition of Sintering provides additional details and links.